Prior to being matched, every mentor and mentee commit to at least one year with the Mentoring Program in order to facilitate a connection. Due to the incredible work and support of our program team, our mentor and mentee friendships last on average 2.25 years, higher than the national average! Walter and his team at California Pizza Kitchen were gracious enough to host our mentees and mentors for a second Bonus Activity this year on October 22nd. 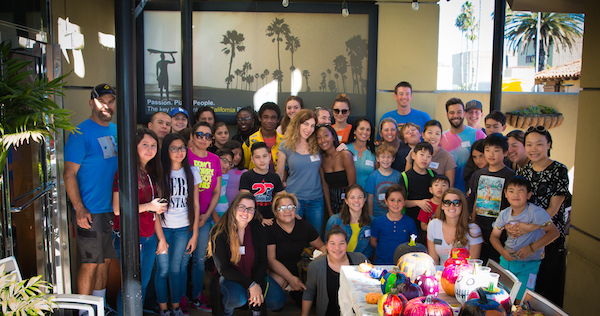 Everyone gathered for a festive day of pizza making and pumpkin decorating. Jason Dolby, founder of the One Hour Long Cycle, selected Walk With Sally as this year’s recipient for his kettlebell lifting challenge on October 21st. Amateurs and Pros alike came together across the world, from Canada to Germany, to participate and take part in raising over $30,000 for friendships! When Russell Hossain, SVP and Chief Business Development Officer of PERL Mortgage, was planning a Grand Opening event at their new office location in El Segundo, he knew exactly which organization he wanted to give back to. Read more to find out about the recent and ongoing partnership between Walk With Sally and PERL Mortgage. Walk With Sally was recognized by the Palos Verdes Peninsula Chamber as the 2017 Nonprofit Organization of the Year! Click through to see the video of Don Knabe’s introduction and Nick Arquette’s acceptance speech. Spoiler alert: this one is dedicated to all the “Sally’s” out there who have to sit their children down and tell them about cancer. This entry was posted in Happenings and tagged 1HLC, Award, Bonus Activity, Friendship Bowl, Mentee, Mentor, Mentor Training, Nonprofit of the Year, One Hour Long CYcle.